Angela Merkel is the unlikely guardian of European Liberalism. The German chancellor may be the only force stemming back a rising tide of intolerance. 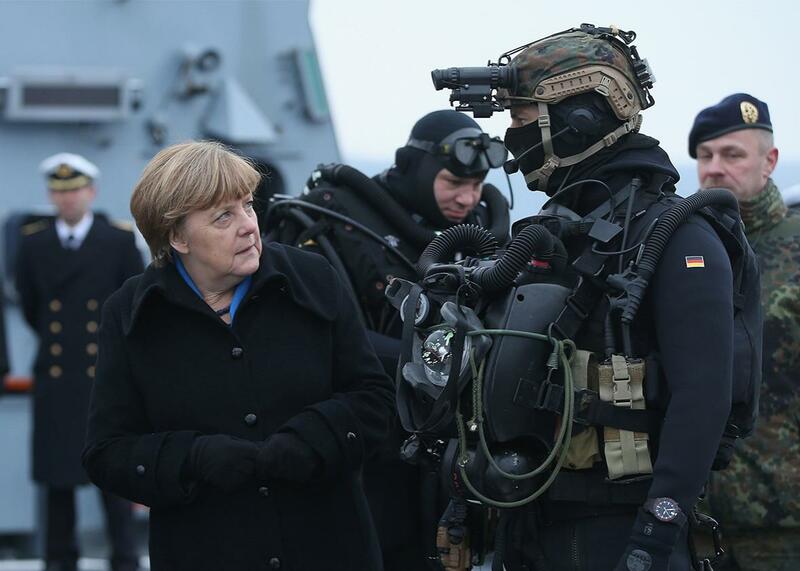 German Chancellor Angela Merkel inspects a member of the German Navy’s Special Forces divers’ unit while she visits a warship on Jan. 19, 2016, in Kiel, Germany. Angela Merkel, Germany’s conservative chancellor, has become the unlikely guardian of liberalism in Europe. During her first 10 years in office, Merkel’s job description was pretty straightforward: keep the German economy humming to hold the continent together. As the leader of the right-of-center Christian Democratic Union, Merkel exercised caution and confidence in equal measure. She was the very embodiment of Germany’s comfortable status quo—until that day last September when she welcomed in the refugees. Merkel’s way of solving problems used to be to throw enough money at them until they went away. In Europe’s recent troubles, such as the Greek debt crisis or Russia’s war against Ukraine, Merkel appealed for European solidarity to rally support at home and abroad. She didn’t exactly advertise it, but she knew that Germany could afford to bail out Greece or sanction Russia. The same idea held true when Hungary’s nationalist prime minister, Viktor Orban, halted a trek of refugees in Budapest late last summer. Fearing a humanitarian catastrophe in the heart of Europe, Merkel abandoned her usual caution and opened Germany’s borders to the stream of destitute migrants. Again, she called on the European Union to share the burden. But Merkel had the luxury of making the morally right decision unilaterally, confident that the German economy was growing and filling government coffers with a budget surplus in the billions of euros. Simply being financially able to host more than 1 million refugees in 2015 didn’t mean Merkel’s electorate was happy about it. There was immediate dissent from the Christian Social Union, the Christian Democratic Union’s ultra-conservative sister party in Bavaria, where most of the refugees were arriving. Members of her own party futilely pressed the chancellor to put an annual cap on the number of asylum seekers Germany could accept. Local politicians of all stripes asked how their communities were supposed to accommodate, educate, and integrate the newcomers. The far-right, euro-skeptical Alternative for Germany party won new supporters, and the xenophobic protest group PEGIDA—Patriotic Europeans Against the Islamization of the Occident—found its paranoia validated. Germany’s Federal Criminal Police counted a record 163 violent attacks on refugee shelters in 2015, up from 28 the previous year. That was the dire state of affairs at the end of December—before hundreds of women reported that they had been sexually assaulted and robbed outside Cologne’s main train station by a crowd of foreign men, including recent asylum seekers, on New Year’s Eve. Nobody cares anymore whether the country can absorb the migrants economically: Germans want to know if their society can bear the social costs. Right-wing populists across Europe are jeering that Merkel’s Willkommenskultur, or welcome culture, was doomed to failure from the start. On the same night as the Cologne melee, authorities in Munich closed two train stations after receiving information about a credible threat by ISIS terrorists. Ten days later, the lone attacker on a Paris police station on the anniversary of the Charlie Hebdo massacre was traced back to a shelter for asylum seekers in Germany. Donald Trump’s proposal to stop Muslims from entering the United States until authorities “can figure out what’s going on” would surely find plenty of supporters for a similar measure in Germany. Even now, in the dead of winter, 3,000 refugees are crossing the country’s border every day. Cologne, an easygoing, multicultural city on the Rhine, was supposed to be a model of how German tolerance works in practice. But tensions came to a head in October, when a candidate for the city’s mayor, Henriette Reker, was attacked by a knife-wielding local disgruntled with her openness toward refugees. She survived and won the election. Reker initially denied there were any indications that refugees might have been involved in Cologne’s New Year’s Eve attacks and reaped scorn for advising women to keep “an arm’s length” to people they don’t know. When it turned out the main suspects were in fact migrants from North Africa, the worst kind of racial prejudices were awoken—not just of dirty and diseased freeloaders, but of dark-skinned sexual predators preying on white women. The government is planning to tighten laws making it easier to deport asylum seekers convicted of crimes. Merkel’s coalition partners, the left-of-center Social Democrats, are playing along. After the excesses of Cologne, the cause for outrage couldn’t be more basic or obvious. Yet the chancellor continues to resist placing an upper limit on the number of refugees allowed to enter Germany. Merkel’s stubbornness can be explained by both domestic and European considerations. For one, a cap would knock down a pillar of the German Constitution, which guarantees a “right to asylum” for politically persecuted people. After the ravages of the Third Reich, which turned millions of Europeans into refugees, making Germany a safe haven for the victims of political persecution became a moral duty. Merkel also understands that if Germany followed Denmark or Sweden in reinstating national border controls, it would signal the end of passport-free travel, one of the EU’s greatest achievements. The so-called Schengen Agreement, signed by 26 countries, was designed to increase the mobility of Europeans by making it possible to travel from Finland to Portugal without having to present an ID once. The free, mass movement of refugees has called into question the practicality of a Europe without borders. Mediterranean countries such as Greece or Italy are overstretched to deal with the numbers of migrants arriving on their shores. And former communist nations, largely ethnically homogenous and dubious of Western multiculturalism, are reluctant to pitch in. The EU’s emergency plan to redistribute 160,000 refugees more equitably has all but failed, with less than 300 relocated so far. Merkel owns the refugee crisis whether she likes it or not. A stopgap measure to rescue people escaping Syria’s civil war inadvertently transformed Germany into a latter-day promised land for millions of people. Yet the influx of refugees isn’t a “German problem,” as the Hungarian prime minister put it. It is the deepest crisis in the EU’s existence—and a fight for the liberal values that define it. It may seem incongruous that a conservative from Germany would have become European liberalism’s greatest defender. Part of the reason lies in the peculiarities of German politics. Far-right parties have played a marginal role given the Nazi legacy. Before German unification in 1990, West Germans across the political spectrum embraced the social welfare state as a way of stifling extremism and competing with communist East Germany. Although benefits have since been rolled back, they are still generous by U.S. standards and part of the safety net Germans have come to expect from their government. It’s difficult to translate the German political landscape to an American context: the left is split into the Social Democrats (old-school labor unionists), the Greens (progressive environmentalists), and the Left Party (unreformed Berkeley communists). The right is held by the Free Democrats (socially liberal, pro-business Republicans) and the Christian Democrats, whose ideological bandwidth probably comes closer to that of the Democrats than the Republicans. The “C” in Christian Democratic Union might as well be lowercase, since German conservatives shun public displays of religion. Flag-waving patriotism and boasting about the military are understandably taboo. Before the refugee crisis, Merkel seemed post-ideological and pragmatic, borrowing from other parties where necessary. Stewardship of the economy and responsibility for Europe were the commonplaces of the German chancellorship. Ruling together with the Social Democrats, Merkel can marshal 80 percent of the votes in the Parliament. Over the summer, she weathered a revolt inside her own party against a third bailout package for Greece. Then came the refugees. What Merkel may have first understood to be another appropriations issue blew up into an existential crisis over what it means to be German—and European—in a globalized world. She took a stand for an open, engaged, and generous Germany. Americans like to talk about the two Americas that so often are on full display: the urban, agenda-setting elites versus rural, homespun traditionalists. But European countries are no different. There are also two Germanies, two Polands, and two Russias, split in irresolvable conflict between the cosmopolitan and parochial. What’s different is that immigration is a cornerstone of American identity, even if successive generations of “natives” have challenged the arrival of newcomers. Learning to live together and expanding opportunity to a growing number of people has been the great American work in progress. America’s tolerance is under threat. But in Europe, the situation is critical. In Germany, as in practically every other European country, immigration is not encoded in the national DNA. Immigration is not part of a shared history as in the United States; instead it’s being imposed on the local population from above. Merkel’s critics no longer speak about Einwanderung, immigration, but Völkerwanderung, a reference to the mass migrations of antiquity that implies hordes of nomads in furs and horned helmets. The German chancellor argues that it’s not in line with Western values if 500 million Europeans aren’t capable of taking in 1 million Syrians. Germany’s attempts to attract talented migrants have been modestly successful. Most immigration came out of the economic necessity for cheap labor, such as the Turkish and southern European “guest workers” who were invited to provide the manpower for West Germany’s economic miracle but were never meant to stay. There is the unspoken hope that today’s refugees will also go home to rebuild one day. For all the goodwill that Germans have shown toward the refugees, the problem that Cologne highlights is that many migrants come from some of the most illiberal places on the planet. Mostly young men from Muslim countries, they have little experience with alcohol or women or freedom. It is a culture clash filled with explosiveness. The Western liberal narrative assumes continuous progress, but it’s only one part of the story. The competing illiberal narrative tells the tale of lost values and eroding nations—and a war against globalization. Europe’s reactionaries are refighting the battles of yore, imagining themselves stemming a new wave of Islamic invaders from North Africa and Turkey. Merkel is right to appeal to Western values, because German money has finally exhausted itself as the only thing of value in Europe. For the past 25 years, Eastern European countries raced to catch up materially with the rest of the continent, reforming their economies and joining the EU. Now people in Poland and Hungary and the former East Germany are looking for something bigger that they can call their own—and it isn’t necessarily liberal democracy or the EU. Liberals plow ahead and forget to look back. Europe, whole and united, was the way of the future, and you were a nationalist obscurant if you believed otherwise. History is returning to Europe, and it’s no longer restricted to the continent’s far eastern reaches. The British may choose to leave the EU as early as this year, and Catalans are agitating for independence from Madrid and Brussels. It’s an irony of history that stodgy old Germany would become the defender of liberalism. When Merkel makes the case for the EU, many Brits and Poles don’t hear the voice of reason but the hectoring of a traditional rival. Europe’s liberal narrative can’t be taken for granted anymore. Merkel and her European values are facing their biggest test yet.